Recently, I got the opportunity to review a game for a bigger game site for the first time since I started “Between Life and Games”. 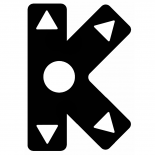 The site is Unikgamer, an awesome gamer collaboration site where people rank their favourite games in many categories, and a total ranking is formed and regularly updated. 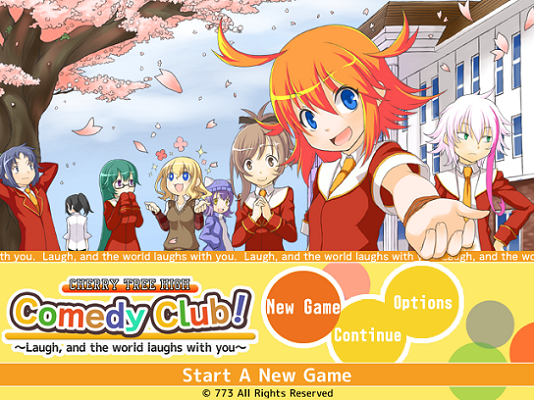 The game is Cherry Tree High Comedy Club – a quirky Japanese indie adventure game, apparently created by the small team 773, consisting of just one full-time member and several contributors. Now, you know me, one of my principles about “Between Life and Games” has always been that the site would be built around my gaming activities, not vice versa (at least until I go professional, hehe ). So I’d just play the games I want to play, and then write about them. And CTHCC does not contradict that – just looking at the screenshots and short YouTube video available, combined with its apparently modest length, already convinced me that it would be a blast to play it right away and then review it. As a script-heavy game that is just so Japanese at its core, the localisation effort was what would make or break Cherry Tree High Comedy Club for Western players. Nyu Media and Tezuka Productions, famous for their fabulous work localising the Phoenix Wright games, have done a very good job in that regard, preserving jokes from the original script that would be recognised by non-Japanese, and replacing the ones that were just “too Japanese” with references to material we would be familiar with, like Star Wars. Dialogue is really a major part of CTHCC, and whether you enjoy the jokes and the tone will greatly determine if you’ll enjoy the game as a whole. Despite being (even) more light-hearted, the game does remind of Phoenix Wright’s overall feel, which can only be a plus. 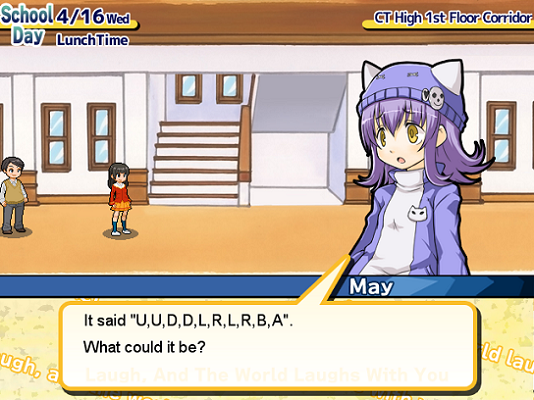 The gameplay is quite simple – you’re the energetic senior student Miley Verisse, and your goal is to recruit at least three people for your club by the end of April (the game starts on March 22nd). To do so, you must first identify your targets and then befriend them enough so that they agree to join the comedy club. For that, you’ll need to gain expertise in subjects they enjoy, like Video Games, Sports, Politics, Fashion, History, Pets, etc. It’s all about stat-building, gaining money to increase your stats, and of course putting those stats to good use by talking to the people. All that in a rather limited time frame. It makes for a rather frantic adventure, spiced up nicely with the story and likable cast of characters, each of them with their own ambitions and problems to take care of, and Miley willing to help them. Last, but not least, there are multiple endings, depending on how well you do! “Laugh, and the world laughs with you.” The game’s motto sums up the purpose of the story quite well. By being a positive person, you affect those around you and make them more positive, as well. At the end, everyone wins and the world becomes a better place. That is Miley’s way of thinking. You shouldn’t expect too much from the story in CTHCC. 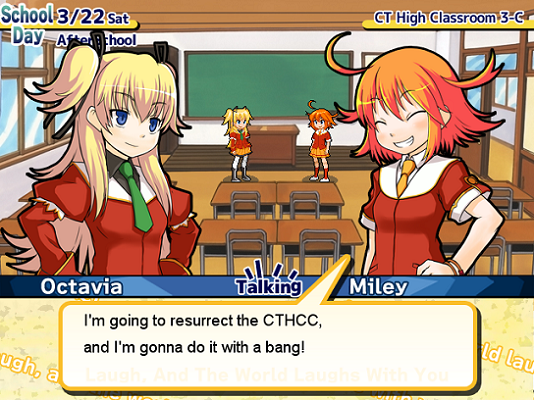 The premise is established in the very beginning of the game, and that is basically the main plot – whether or not Miley will be successful in resurrecting the once-famous Cherry Tree High Comedy Club. It’s not about saving the world, it’s not epic in any sense of the word… It’s a bit like a “slice of life” anime. But it’s very charming, mostly thanks to the overall atmosphere, the characters, and their youthful aspirations and willingness to follow their passions and find their identity in life. It’s also a story of friendships and dynamic interaction. Miley is friendly to all her potential club recruits, but some of them do not get along so well between one another, making for some hilarious moments and exchanges. 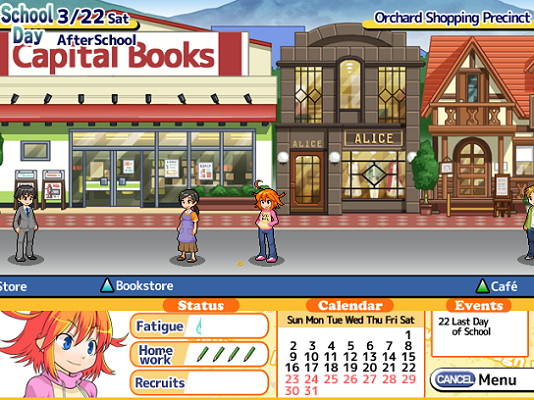 Miley’s world, at least in the game, is within the confines of Cherry Tree Town, which has several prominent locations where schoolboys and girls like to hang out. Of course, the school itself and her dorm, called Unity, are the ones she spends the most time in. The town also has a Japanese shrine and castle, which the localisation team has tried to explain, to moderate success. To be completely honest, I’m not too keen on the localisation idea in itself, I think the game would have worked better if it had just taken place in Japan, even for the English version (perhaps with just replacements of those cultural references certain to remain lost with Westerners). But I still have to highlight the quality of the localisation effort, which really reduces this feeling of awkwardness to a minimum. There is really nothing to complain about, even spelling and grammar errors are kept to an acceptable minimum. 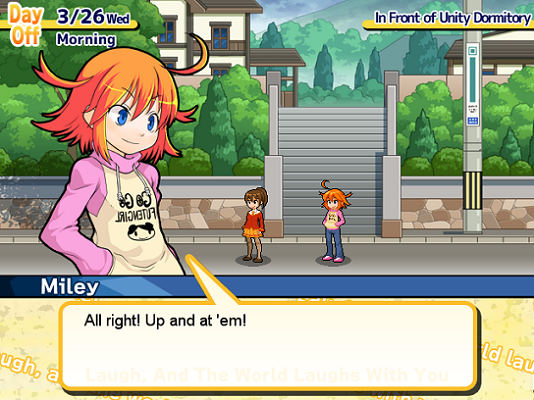 Adults aren’t featured very prominently in the game, aside from a couple of key characters in the dorm manager and the comedy star Miley looks up to. But interestingly, the game features a big corporation that is friendly and cooperative with the town’s citizens, instead of just trying to milk as much money from them as possible and not care about their interests in the slightest. Dialogue is everything. There’s a lot of variety in what your friends have to say to you (changing daily), and even in what NPCs in the various locations you can visit say (it changes weekly). There are also scripted events, happening either on certain days, or as you “level up” your closeness with somebody. In the end, it’s a lighthearted (with some more serious moments that can touch you), but also quite heartwarming story. While the story and overall atmosphere are good, it’s the cast that makes CTHCC really stand out. Yes, the majority of main characters are highschoolers, not particularly mature, much less deep. But it’s a game about the theme of adolescence and the youthful ambitions of high school students. That’s a theme that is not so “Japanese” as the rest of the game, it’s quite universal and one even older people like myself can understand and enjoy. Well, one could say that most, if not all of the cast fall under one or another anime cliche, but, as I’ve said before, what isn’t cliche anymore? The characters complement one another nicely, each of them different from the others, so it’s never dull seeing them interact. Miley Verisse is the protagonist and truly the shining star of the game. An aspiring comedian, she comes back from a mysterious “adventure” that we’ll only learn very sketchy details about, and she takes on the task to resurrect the Cherry Tree High Comedy Club. From the very start, she is in a situation where she must be very active to succeed, and she is (if you want to beat the game, of course)! Miley is an energetic girl with a great sense of humour (naturally) and a bit of a troublemaker. She considers herself a hero and often acts inappropriately for a senior, perceived as much more childish by the outside observer. Miley is usually nice to everyone, but has a hard time getting really close to people. Yet, she must make the effort to get close and convince her recruiting targets to join her, or else her comedy club dream will not come true. Miley really impresses as the story develops, especially with her ability to empathise with others and offer help when needed. The role of the antagonist is taken by Octavia, Miley’s childhood friend who, having grown up in a rich family and having become rather snobbish since their early days, now really hates Miley for being such a hopeless dreamer and an irresponsible person, and considers it a disgrace she was once friends with her. She is also the president of the school’s student council and tries really hard to make it a point to Miley that she’ll do everything in her power to prevent Miley from forming her club. None of that manages to get Miley down at all, and she not only doesn’t give up on the club idea, but takes the threat as a challenge to prove herself and heroically bring down the evil empire of the student council. Continuing to tease Octavia and call her with made up nicknames (like “Olly Octopus”) in the process. Octavia is an interesting character that is successful as Miley’s foil, being by definition pretty much her anti-thesis – snobbish, easily annoyed, and looking down on others, as opposed to Miley’s cheerful and helpful nature. As you play, you’ll also notice that there is more than meets the eye about Octavia. The person Miley is closest with is her roommate Harriet. 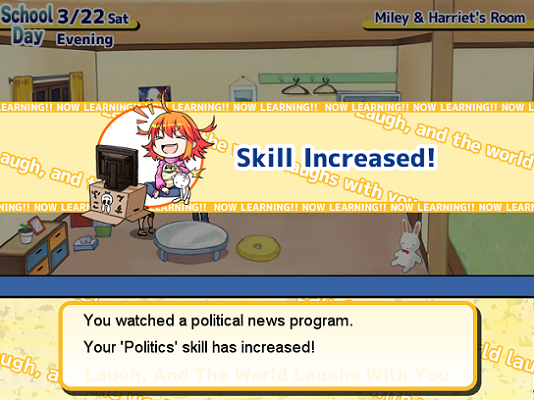 Harriet is also already a founding member of the comedy club as the game starts, Miley having signed her up in advance. She is the “pretty, but down-to-earth” girl type, and her dynamic with the more head-in-the-clouds Miley is interesting to watch. It’s also entertaining how, while many of her friends are interested in romance and relationships, Miley acts a bit above those things (although she does occasionally get jealous when others say how pretty Harriet is). The two live in a dorm managed by the “adult, yet not acting quite like it” Dina, who is a very good cook, but also has a weakness to alcohol and gambling, adding extra flavour to the game. Still, ultimately a good and caring person, she tries to give the girls some guidance where she can, while also making sure they follow the strict dorm rules (it’s an all-girls dorm, so do not expect to see any boys around at any time). The recruiting targets Miley chooses are quite varied, from the shy and introverted Sara, through Cindy, the future rock star who likes to skip school, to Tyler, the stalker who has a notebook with all the Cherry Tree High girls’ details. There are also the enthusiastic exchange student Vivian, the pretty boy, but loner Curtis, and the candy store owner May. As you can see, they are quite different from one another, the one thing truly bringing them together being Miley and her passion for comedy. She believes each of them has some comedic talent and can be of use for the club. But, for there to ever be a club at all, she must persuade at least three of them to join! Each of the potential members has a little storyline that develops as Miley gets closer with them. Furthermore, with the cast being so different, while some friendships are made, it is inevitable that not everyone gets along with everyone perfectly. This is also the source of some fascinating moments that will often bring a smile to your face. Finally, I must mention also a few characters that are not recruiting targets, but are also important to the story. First of all, there’s the shrine maiden Elise, a rather familiar sight with her traditional outfit, but a key character that plays the role of support for Miley, being her good friend, and offers that little touch of the mystical that further adds something nice to the game. There are also Stan the Comedy Man, who is the TV-famous local-born comedian that Miley really looks up to, Rebecca, one of Capital Group (the local corporation)’s officers, Cindy’s friend and fellow band member Mikey, and Vivian’s older, quite lady-like sister. And let’s not forget the NPCs who often have something interesting to say and enhance the player’s experience. In total, CTHCC should take you around 6 hours to beat. The gameplay mechanics are relatively simple. There are 7-8 locations around the town that you can visit, such as the shopping precinct, the shrine, the school, the park, etc. Each of those is a 2D sidescrolling stage. Numerous NPCs wander about, and you can talk to them, of course, the targets and other important characters are also around. There are also shops, a cafe, a movie theater, a video game arcade and such, where you can buy items or hone your skills. Lastly, you can occasionally find items on the ground and pick them up. By holding the “Action” key (Enter in the default control scheme) and pressing a direction, Miley runs, enabling you to get through the stage more quickly. Not that the stages are that big to begin with, but it’s useful when you’re looking for just a particular person or place. The goal of the game is to recruit at least three people for your comedy club, and that is done by chatting with them on subjects they enjoy. Occasionally, you’ll get hints as to what subject they enjoy and what they don’t – naturally, it’s in your best interest to talk to them about the things they like. 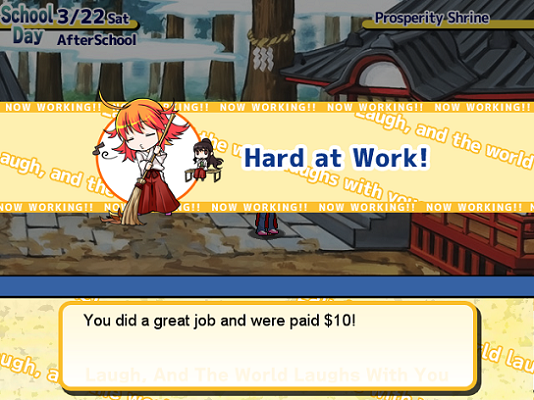 I suppose this mechanic works kind of like in a dating sim (haven’t played one yet). The higher your level of knowledge on the subject in question, the better the chance you “level up” your relationship with that person, too! Both the subject and relationship levels go up to 5. Once you get something at level 5, you need not put more effort into learning it. You can check out both your subject and relationship levels through opening the menu with the “Cancel” key (Escape in the default settings). You can also view your items or change some game options in that menu. Chat subject levels can be increased by reading a magazine on the subject (you can buy them at the bookstore), by watching TV (increasing a random subject’s level), by watching a movie, etc. Money is relatively important in the game, and you can only earn it by working and collecting bottles (but finding 10 of them only nets you a measly $3). There are a couple of jobs initially available – helping Elise clean the shrine in afternoons, and making beaded jewelry in the evening. You also need to do homework occasionally. But working increases your Fatigue levels, and you aren’t as efficient afterwards. In order to recover better, you can go to sleep early on evenings. There are also items to help you recover from Fatigue, but they’re rather useless. 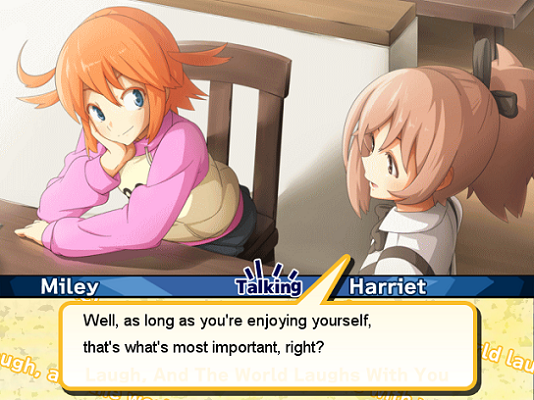 Saving the game is done by talking to Harriet in your room in the evening. There are a few special events that concern the gameplay. In the beginning, it’s spring break, so you can use both mornings and afternoons at your pleasure. Soon enough, it’s time for school again, and your mornings will be spent at school, where you can also speak to your recruiting targets, but you can’t “hang out” with them to talk about a particular subject and try to level your relationships with them up. There are also useful occasions when Miley wakes up and feels “The Need for Speed,” meaning she’ll be hyperactive that day. This simply translates into her being able to earn more money from work and increase her skills faster than normally. For an indie game, CTHCC looks quite nicely. Of course, it works with limited resources – for instance, there are only several possible expressions each character has, but they are quite sufficient to cover the possible moods they go through during the game – amused, happy, bewildered, embarrassed, angry, etc. 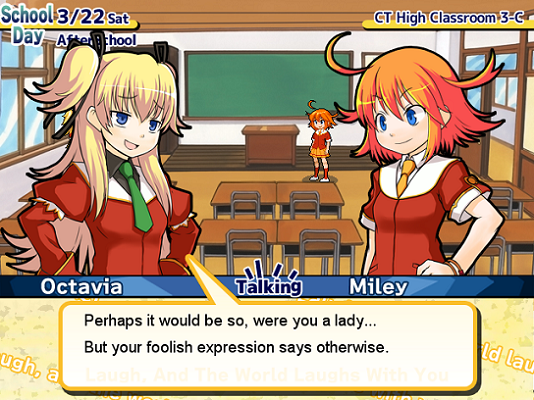 During dialogue, one character’s picture is displayed to the left, the other’s – to the right. And you’ll immediately notice that the left ones’ pictures are inverted (quite easily seen when they have some kind of writing on their clothes). Outside of dialogue, they’ve gone with the cutesy look for the full body models. Strangely, even adults’ models look like teenagers… The environments are nothing special in terms of looks, but they work fine. 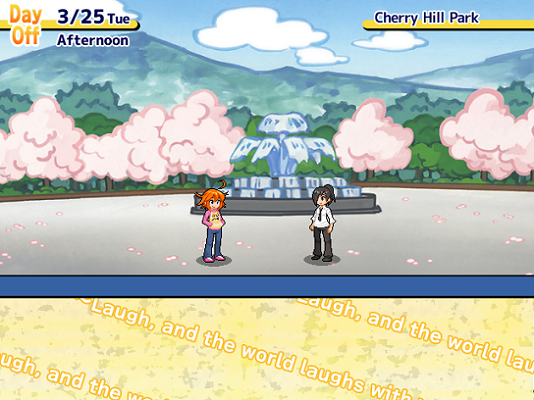 They depict each of the locations in Cherry Town appropriately, the park standing out in particular, with many of the trees giving the town’s name. The music in the game is quite pleasant and catchy. Naturally, it’s not the best soundtrack ever, but I’d say it’s more memorable than many big-budget games. There are only a handful of tunes, but they’re considerably long and it’s no problem that you’ll hear them repeat often. Most of them are very nice. There are also neat sound effects – such as a laughing sound occasionally, when the characters say something funny. The song I have chosen plays while you’re at school. Cherry Tree High Comedy Club is a really funny and memorable game, one that demonstrates that budget is not everything and even small teams can produce great products, as long as they have the vision and passion. The story is nothing grand, but the cast of characters really makes the game, with Miley being a really good and fascinating protagonist. The stellar localisation effort helps retain the spirit of the original Japanese version. While the gameplay is simplistic and relies on a few key principles, it is still very enjoyable and does not feel too repetitive. It is an interesting race against time, as the deadline for club registration approaches and you still have not recruited the necessary number of members. At the modest price of $8, CTHCC is a very good purchase. Once you achieve the best ending, there won’t be much replay value, but the emotions the game will provide you with until then are well worth that price. If you enjoy anime, especially of the high school kind, this game is highly recommended. It is published by Capcom – they wouldn’t pick up just any game. CTHCC and its characters will put a smile on your face.